Cairo is the capital of EGYPT and the largest city in Africa. The city’s strategic location on the NILE RIVER has made it a defensive stronghold for Egypt for nearly 1,500 years. In medieval times, Cairo was one of the busiest centers of trade and education in the Mediterranean and Middle East. Today the city remains a vibrant hub of Islamic culture and politics. Before the founding of Cairo, other great cities had risen and faded in the area. Just to the southwest was Memphis, the first capital of ancient Egypt, built by the pharaohs around 3000 B.C. To the northeast stood Heliopolis, an important religious center around 2500 B.C. It later housed Greek schools where Plato and other famous philosophers studied. 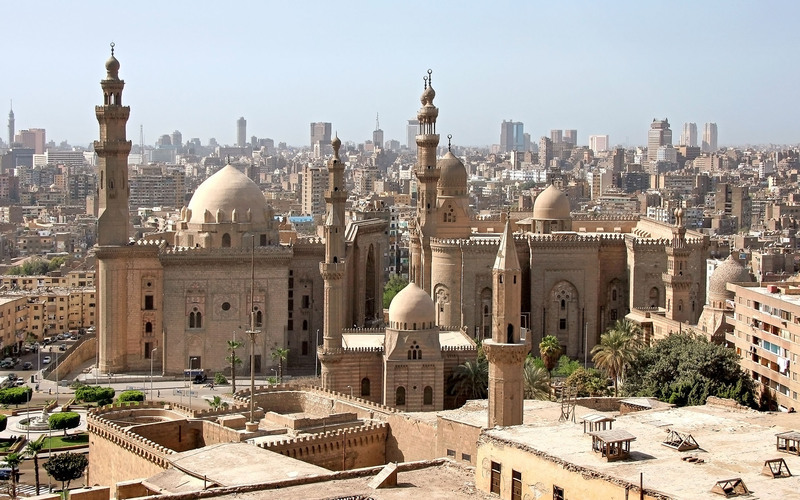 Modern Cairo began as a military camp. It was established in A.D. 640 by Amr ibn al-As, an Arab leader who brought ISLAM to Egypt. Over the next 300 years Arab rulers added to and improved the city, known as al-Fustat, which developed into a major river port. In 969 the Fatimids, an Islamic sect, invaded the region and built the city of al-Qahirah (meaning “The Victorious”) northeast of al-Fustat. Cairo is the Westernized version of al-Qahirah. The Fatimids expanded the city and built the mosque and university called al-Azhar, one of the greatest centers of learning in the medieval world. The university still exists today. Al-Fustat remained the region’s commercial center for nearly 200 years. In 1168, however, it was burned by the Muslims to keep it from falling into the hands of Christian invaders. The Muslim leader, Saladin, went on to establish a large empire with Cairo as its capital. During the Middle Ages, Cairo occupied an important place in the spice trade between Europe and Asia. By the 1340s its population had reached half a million. But beginning with an outbreak of the Black Death in 1348, Cairo was struck by a series of plagues and other misfortunes. A sea voyage that occurred just before 1500 changed the country’s fortunes. The Portuguese explorer Vasco da Gama reached Asia by sailing around the southern tip of Africa, opening a new route to the countries that grew spices and eliminating Cairo’s key role in that trade. Then, after the Turks conquered Egypt in 1517, Cairo lost its place as the capital of a major empire. The city fell into decline. By 1800 its population had shrunk by nearly half. In the mid-1800s the construction of the nearby SUEZ CANAL and a railroad between Cairo and ALEXANDRIA brought immigration and new growth to Cairo. After 1850 the city developed along European lines inspired by improvements made in Paris. Large boulevards were added to handle motorized vehicle traffic, new bridges were built, and utilities such as gas, electricity, water, and telephone were provided. New public transportation services enabled suburbs to multiply outside Cairo, and by the end of World War II the city was home to more than 2 million people. Since then, Cairo has grown enormously, with new suburbs spilling out into the surrounding desert and Nile delta. Today Cairo’s population approaches 12 million people, which means that about one in every five Egyptians lives in the city. Cairo’s rapid growth, however, has caused serious problems of pollution and unemployment in the area. Although predominantly Muslim, the city contains the largest concentration of Coptic Christians in the world.